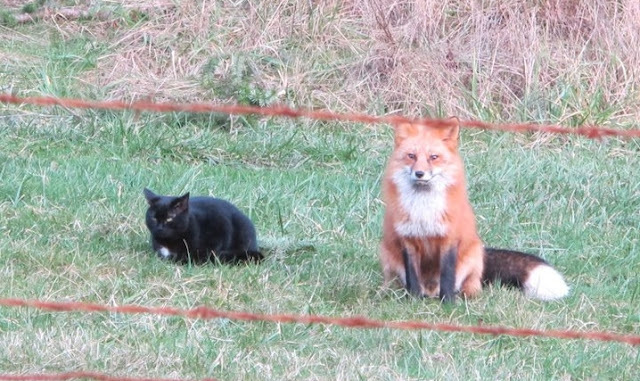 A red fox and stray cat appeared to be the best of friends near Roche Harbor on San Juan Island. Their touching relationship proving that friendship can survive despite background and social pressure, or in the case of these two, natural instincts. Here are a few facts to put the presence of foxes in your yard in perspective:Foxes are not dangerous to humans, except when they are rabid (which is very rare) or when they are captured and handled. Even then, a fox’s natural tendency is to flee rather than fight. -Foxes may prey on small pets or livestock (such as rabbits, guinea pigs or chickens), so pets should be kept indoors or housed in sturdy structures. -Foxes will also eat various fruits, but they usually do not bother garden vegetables. -Sometimes foxes are blamed for damage they did not cause, such as when they are spotted eating from spilled trash when neighborhood dogs or other animals were responsible for the overturned trashcan. -A fox cutting through your yard is probably just passing through on his way between hunting areas and no action is necessary on your part. 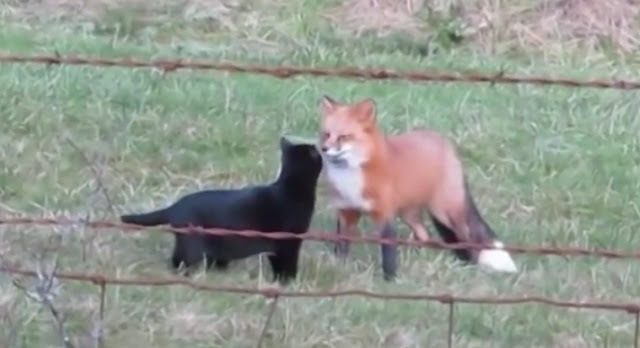 Responses to "The adorable and mysterious friendship between a red fox and a wild cat "
Happy are those who live close to nature, animals.